Alternatives, a Quebec based international solidarity group, promotes democratic rights, environmental sustainability and and human dignity. 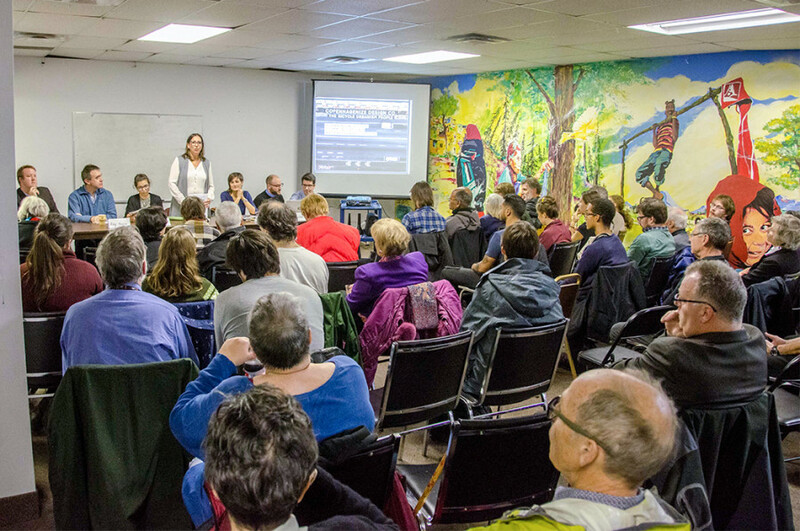 This assembly about safety on the Montreal roads for cyclists and pedestrians started with a panel formed of five members brought in by the Building Community, a popular education committee of the Milton Parc Citizens’ Committee. 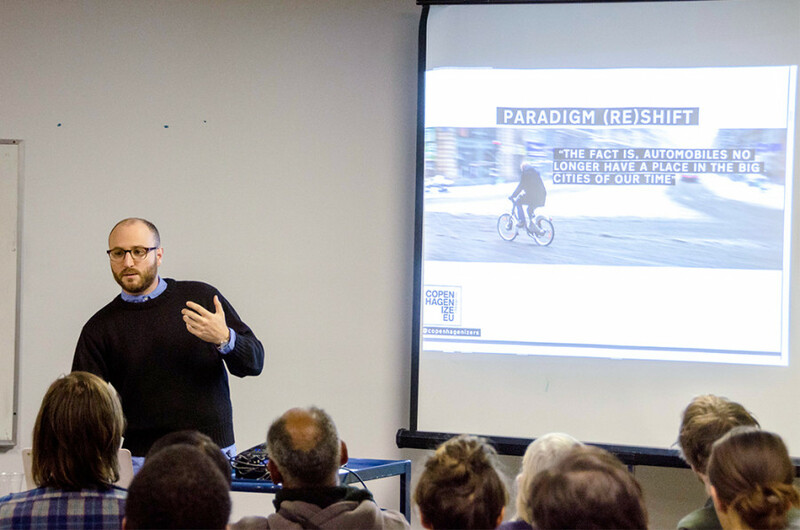 The panel included city councillors Alex Norris and Marc-André Gadoury, as well as an expert on bicycle urbanism, and an advocate for pedestrians and a representative from Vélo-Québec. The packed room sent a clear message through the night, being highly concerned by their security as cyclists or pedestrians. Michael Wexler from Copenhagenize Design Company presented the results from a study of some Montreal intersections. “Streets are democratic places,” said Wexler, meaning that people express how they use the roads without being asked. Wexler gave examples such as paths created through a patch of grass instead of around it. Studies like these strengthen the comprehension of how cyclists use roads, and give important clues as to how the infrastructures should be modified to meet people’s behaviour, according to Wexler. The technique also allows the identification of “counter flow interactions,” which is where accidents or near misses can happen. The panel seemed to agree on the necessity of modifying infrastructures to protect the cyclists. Magali Bébronne from Vélo-Québec said the number of trips made on a bicycle has increased by 57 per cent between 2008 and 2013. A number that clearly says of the issue of cyclists’ safety won’t be fading away anytime soon. 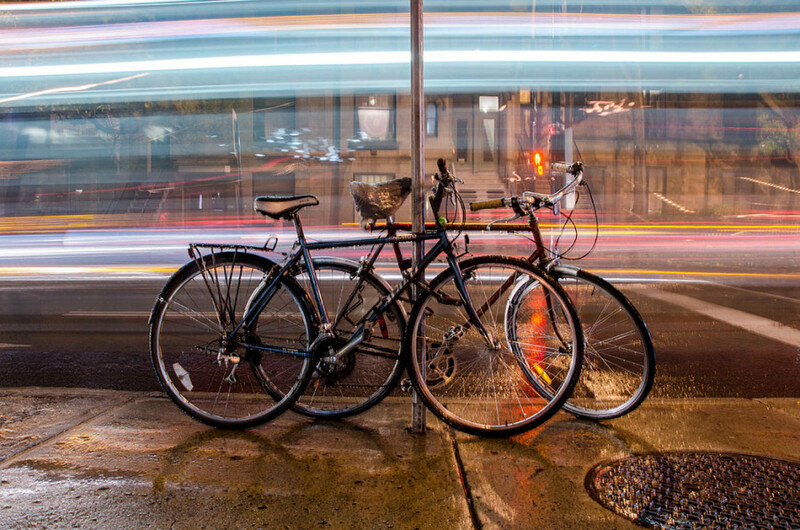 Bébronne argued that in the making of infrastructure in Montreal, “the bicycle reflex is not quite acquired yet”, meaning that just as sidewalks are now integrated in the creation of roads. The same should happen to include bicycle paths. In this report, the Agency said that the solutions to lowering the amount of accidents are to reduce the volume of car circulation, as well as the speed limit, and to create separated infrastructures. Reducing the amount of cars on the road goes along with reducing parking availability, argued Bébronne, therefore encouraging people to consider alternatives to the use of a car. Alexandra Coelho, project manager at the Montreal Urban Ecology Center, told the audience that for all trips of less than a kilometre, walking is the most efficient way of transport. This considered, 50 per cent of such trips are done by car in the bigger cities of the province. The audience took all this information in, and had a lot to say on which solutions should be applied to the different intersections of Montreal. Wexler suggested that the suggestions of intersections to study be brought to him after the assembly. The two elected representatives present did not seem to take such notes while listening to the cyclists and pedestrians’ testimonies. The will of the participants and the strength of their concerns for their safety gave a powerful impression. “It’s a public health crisis”, said city counselor Alex Norris, stating that Plateau Mont-Royal is the borough with the highest number of pedestrians and cyclists being hit by vehicles. The solutions said to be in the making by the city councillors didn’t seem to satisfy the needs brought up by the pedestrians and cyclists present; the need for public consultation to personalize the modifications on the actual infrastructures. Such public consultations are not however part of the city’s plan to secure 500 locations of the road network in the next ten years.